In early 2016 our management team attended a two-day workshop to kick-off a new marketing practice for the company. During the first session a question was posed that really grabbed our attention, “What do your customers really want?”. This gave us pause. I mean, we should all know the answer right? Then, answers started coming back: They want the lowest price, They want the best value, they definitely want a quality product… all of these were right, but we struggled to find one answer. To help us answer this question, the facilitator posed another, similar question, “What do YOU want from YOUR suppliers?”. Well, we knew the answer to that one. Our business lives and dies by our suppliers delivering exactly what they promised when they promised it. At that point we realized, our customers are no different. We’ve always known that we don’t win on price, or even something vague like value. Quality is a must, but if we miss the deadline or deliver incorrectly, it’s still not going to work for them. We win only when we deliver exactly what we say we’ll deliver, how we agreed to deliver it, when the customer needs it. After the two-day workshop was over, we agreed it was time we found a way to measure how well we were doing delivering this expectation to our customers. Why do it? The first reason—our core values include the age old lesson to always treat others the way we want to be treated. 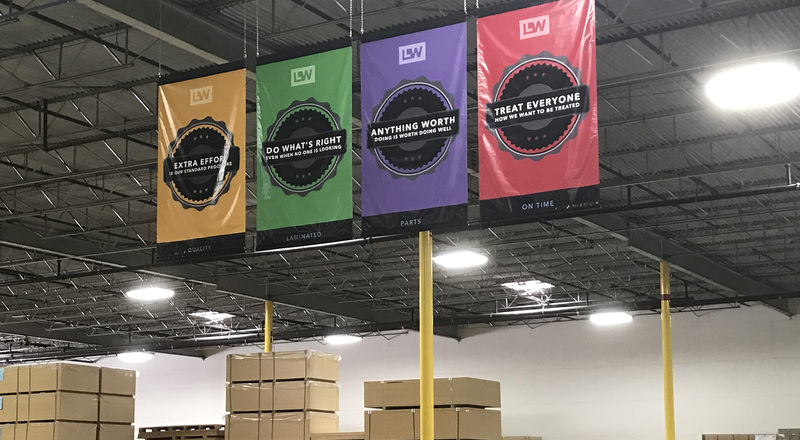 The second reason—we knew if we held ourselves to a higher standard driven by what our customers really want, in the end that would be best for everyone. Now came the hard work to create a new way to measure what we were now calling Quality On Time starting in 2017. In 2016, we calculated performance based on whether an order was completed and left our facility according to the last agreed upon timeline that was communicated to the customer. Even if that date had slipped back due to material delays like rejected laminate or delayed core delivery. But that’s not what our customer wanted, so the new number needed to reflect any deviation from the first agreed upon delivery date. This new algorithm must now account for EVERY issue that might affect a customer, whether it’s our fault or not, no matter how small. The new requirements demand that every order has to be delivered when it was promised with the right core, the right laminate and the correct edge material. It has to be free of defects and all routing, boring, and grooving have to fall within the tolerances of the customers specifications. In addition, the paperwork, packaging, shipping and billing all have to be done exactly the way we agreed to do for each customer. Any issue that comes up effects the number. Was there a damaged part or panel? QOT takes a hit. Did the paperwork go out with the wrong order number on it? That’s a huge pain, QOT tracks it. What if a supplier fails to deliver to us when they said they would and now we can’t manufacture the order for our customer? While that’s not our “fault” it’s still not what our customer needs, so it goes against our numbers. We realized that by holding ourselves accountable, we hold everyone involved accountable which makes us all better at delivering as promised. After establishing these new parameters, step one was to rewrite our accounting software to allow us to track and change order fields so we’d be able to reflect any issues that came up and see where the problems live. Once we had that in place the entire organization was trained to understand the new direction and why is was important. Every order has two components. Quality and On Time. For Quality, if the entire order gets to the customer and meets their specifications, it passes. If there are any issues whatsoever, the entire order fails. For On Time, the entire order must get to the customer on or before the agreed upon delivery date and time to count. These two components are individually calculated by dividing the number of orders that pass by the total orders. Thus giving a running monthly and yearly total. Then, those two numbers are added together and divided by 2 to get a final monthly and yearly Quality On Time (QOT). To make sure everyone would have the latest information we set up a tracking sheet that is emailed to the management team each day. In addition, we set up TVs in each break room location with a slide that is updated daily showing the new numbers. For everyone else, our numbers are posted on our website under each industry page. 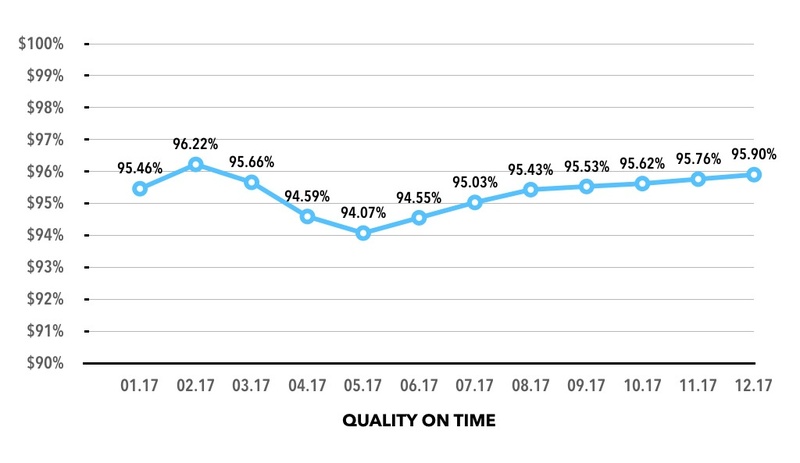 In 2016, our on time was a respectable 88%, but we knew we could do better. We had never tracked quality up to this point, so we weren’t quite sure where to start there. We really had no idea what would happen with the numbers when we set out to track our orders in this new way. So we set a goal. If we could hit 94% for the entire year that felt like a number we could be proud of and that would make a difference for our customers. Plus, it would save us labor and material costs on remakes. So, we had our new number and process, we had a goal, now it was time to put it into action. On January 1, 2017 we turned everything on and started tracking the results. At the end of January we were at 95.46%. Great, we exceeded our goal out of the gate. On one hand we were surprised, but at the same time, we’d seen time and time again how our team could deliver when given a challenge. So we doubled down and challenged ourselves to keep finding ways to improve and measuring our results. In February we ended at 96.22%. Perfect, let’s keep going. Over the next several months things dipped slightly and then came back up as we adjusted to some new customers and increased volume in both our facilities. For the remained of the year, we saw QOT slowly work it’s way up each month as we identified problem areas and did the hard work to fix issues as they came up. There were some bumps in the road, like a supplier who stopped delivery for almost 2 weeks during an order processing switch over. Even with all of that, by the end of year we’d reached a final QOT of 95.90%. Well above our original goal. 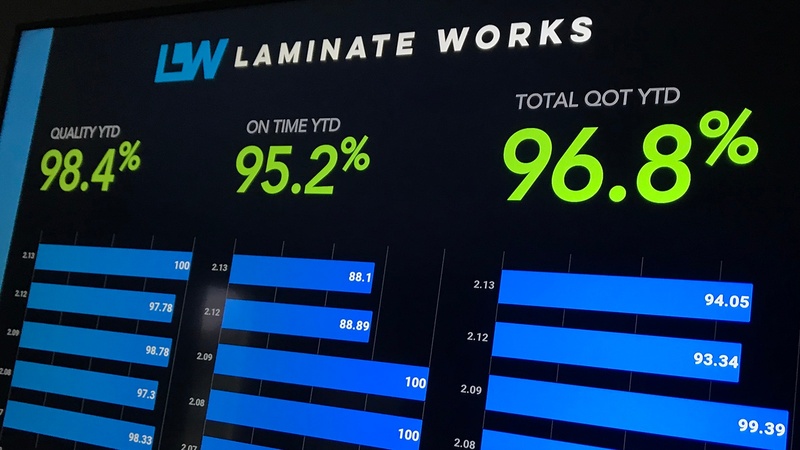 The best parts were that customer retention was up, error costs were down, and our employees knew where we stood with a measurable indicator that was simple and easy to communicate. There were numerous lessons learned through this whole process but three that really stand out. Your customer should be at the center of everything you do, what’s good for them is good for you. Don’t be afraid of change. You don’t have to do things the same way just because everyone else is doing it that way. If you have an idea that feels right, go for it. We’re always looking for way to improve what we do and how we do it. Our next step is to track QOT at the item level, not just by order. In addition we’ve implemented a tracking system for each non-conforming procedure throughout the entire organization. Look for a future post that details our process for creating and managing Standard Operating Procedures (SOPs) and tracking Non Conformance Reports (NCRs). Learn more about our capabilities and the industries we serve.